After a month without international competitions. 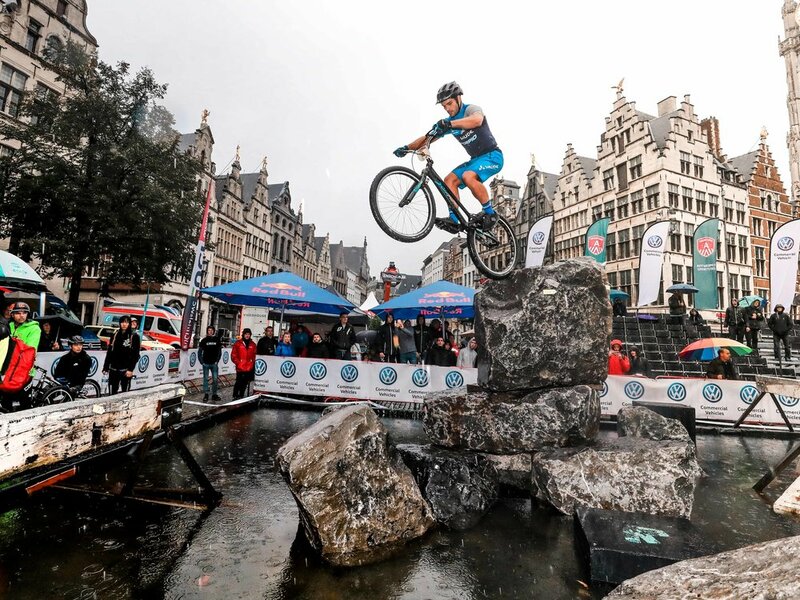 The third round of the UCI Trials World Cup was held this past weekend in Antwerpen, Belgium. The unbeatable location of this world cup makes a different atmosphere live that most riders love. It is located in the "Grote Markt" of the city where there is always a lot of people walking that stay to see the show. Although the predictions were of rain all weekend, on Saturday, during the quarterfinals the sun came out to shine and it was very confortable to ride. The next day it was not like that and it rained all day, besides the low temperatures that did not rise over 12 degrees, two factors that made even more difficult the sections of the semifinals in which Tarrés was facing. At this world cup attended a total of 148 riders from different 20 nations all over the world. From Japan to USA and many European countries. On Sunday at 11am started the semifinals of 26 "where Tarrés had to fight for the pass to the final. There was one section of concrete, one of stones on the water, two of stones, and one of logs. Needless to say, the rain and the cold not only hampered the shape of the riders but the state of the sections, much more slippery than in dry. This was very important factor to take into account when choosing the line and when riding in the sections. Tarrés started in section 1, finishing with 0 penalty points. The next area was one of stones, it started very well, passing all the gates without any problem until in the last one, he could not get through and ended up falling off the bike. Pol tells us that he was really exhausted because the section was very long, and he did not take enough rest to attack the last stone and did not have the strength to pass it. Tarrés I finish with 0 points the two following sections. He felt very well and strong, he liked the sections very much. He had left only one section to finish the first. In one of the sharpest rocks of the competition Tarrés did not put the rear wheel over and fell penalizing, again, with the maximum score. He finished the first lap with a total of 10 points an 11th position. Photo by Leo Zhukov, take a look at his instagram for awesome pictures. In the second round, Tarrés was able to rectify the mistake of the stones and finished with 2 points in the two sections he had made five and two zeros in the others. He had an section to finish, the concrete. He went through all the obstacles in the section until facing the last, the biggest and most difficult of all. Very tired he tried it 4 times and could not clean it. Finally 19 penalty points and eighth position in the competition and sixth in the overall of the UCI World Cup.